Summer is winding down, fall will soon be upon us, but as an equine owner we must still be vigilant about our horse’s health. Potomac Horse Fever (PHF) is causes by a rickettsial organism, Neorickettsia risticii. Cases occur most commonly in the summer and fall seasons, especially in horses that live near a body of water such as a pond, lake or stream. Horses contract PHF by the ingestion of aquatic insects, such as mayflies or caddisflies, which are infected with the organism. The organism invades and infects cells in the body, specifically the cells that line the horse’s gastrointestinal tract. The horse will develop diarrhea as a symptom from the inflammation and the colon’s inability to properly absorb material. The immune response will give the horse a fever and cause lethargy and inappetence. 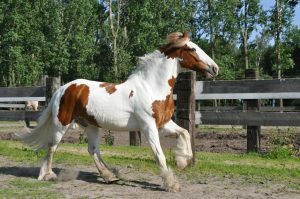 Horse’s with PHF become very ill quickly and can also develop laminitis as a result of the infection. Aggressive supportive care is needed when treating horses afflicted with PHF. Antibiotics, anti-inflammatory drugs, IV fluids, electrolytes, icing feet, and nursing care are the mainstays of treatment. Horse’s with severe infections often do better in a hospital setting where they can be monitored 24 hours a day and be kept on IV fluids to maintain their hydration. The prognosis depends greatly on the severity of clinical signs and whether or not the patient develops laminitis. It is very important to know your horses well and catch this illness early so treatment can begin before the horse becomes critically ill. Horses usually respond positively to treatment in the first 24 hours, with a decrease in fever, an increase in appetite, and a happier demeanor. PHF can be diagnosed using blood antibody titers and PCR tests of blood and feces. The titer will show you if the horse has been exposed to the rickettsial organism, but won’t necessarily definitively tell you that it is what is causing the current illness. PCR looks for the organisms DNA in the sample and is a more accurate test to diagnose the disease. Clinical signs and physical exam can often tip off your veterinarian that this may the cause of your horse’s symptoms and the supportive treatments are often implemented before an official diagnosis is made. There are several ways you can reduce the risk of PHF for your horses. There is a vaccine available, and it is recommended for any horse’s in the greater Potomac region whom live near bodies of water. The vaccine does not always prevent infection with the disease, but will hopefully decrease the clinical severity of the illness if your horse should become infected. Covering horses feed and not leaving it out will prevent insects from getting into it and decrease the chance of your horse ingesting an insect infected with the organism. Turning off lights at your barn and near pastures at night, or changing out the bulbs to a blue light, will decrease the amount of insects attracted to the area, also decreasing the chance of infection. Early detection is key, so knowing your horses normal behavior, monitoring their manure, and temperature as needed, will assist in the prompt discovery of illness and early treatment of a potentially deadly disease.